Our mission at Parents Choice Child Care is to develop children to their full capacity by establishing a consistent, loving, secure environment and providing developmentally appropriate curriculum for them to learn and grow emotionally, spiritually, and physically. PCCC is a Registered Ministry through the state of Indiana and the FSSA (Family and Social Services Administration). We voluntarily participate in the Paths to Quality Program, a statewide ranking system that assesses a center's commitment to supporting children's development, learning, and future success in school and life. We are currently at Level 3 and are actively working our way towards the highest ranking of Level 4 which includes National Accreditation. For more information about Paths to QUALITY, click the picture to the left. Our teachers and staff work with 4C of Southern Indiana to participate in ongoing education, training, and other resources for the children and families we service. For more information about 4C of Southern Indiana, click the picture to the right. PCCC also is an approved Pre-K program for On My Way Pre-K. On My Way Pre-K is a program through the FSSA that provides grants to children to participate in a high quality preschool program. For more information, click the picture to the left. 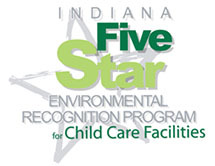 Parents Choice Child Care participates in the Indiana Five Star Environmental Recognition Program. This program focuses on recognizing facilities that promote healthy development in young children free from pesticides, harmful chemicals, lead paint hazards, radon, and other often invisible environmental health threats. For more information about this program, click on the picture to the right.